As a native of New Orleans, Max Ryan has spent his life surrounded by the magnificent visual art, architecture, music, and cuisine that are unique to the Crescent City. After graduating from Metairie Park Country Day School, Max's college career took him first to Rhodes College, and then back to New Orleans where he earned his degree from Tulane University. While exploring a diverse curriculum in college, Max remained an avid artist. In 1994 Max embarked upon a career as a professional contractor specializing in residential projects with dual emphasis upon both historic properties and contemporary design. Even while nurturing his growing business Max continued to develop his artistic skills. 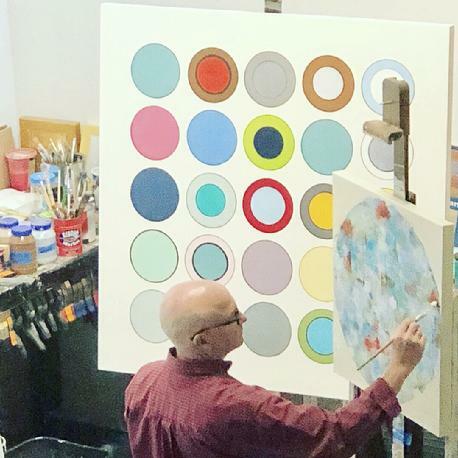 Today while working primarily with acrylic paints on canvas, Max uses layers of texture and deep colors combined with metallic leaf and a variety of glazes to create a diverse collection of contemporary pieces. His artwork is heavily influenced by his background in building and design as Max draws inspiration from architectural elements in creating his mixed media abstract paintings. Max's work has been featured in numerous galleries and exhibitions as well as local and national magazines. His paintings also hang in private collections throughout the world.